If you are a pet lover, you would have faced moments in life where you have to select between your human relationships and your pet relationship. Most of the time, your family members or your lover can get mad at you when your love and affection is completely taken by your pet lover. There can be a situation where they ask you to select between your pet and them and if you don’t play the cards wisely at that time, then you would end up not only in losing your pet but also your loved ones too. However, there are some people who think that it is not right of their human friends to ask such things as selecting between them and pets and one boyfriend who had faced the same situation decided to give his girlfriend the best response ever. 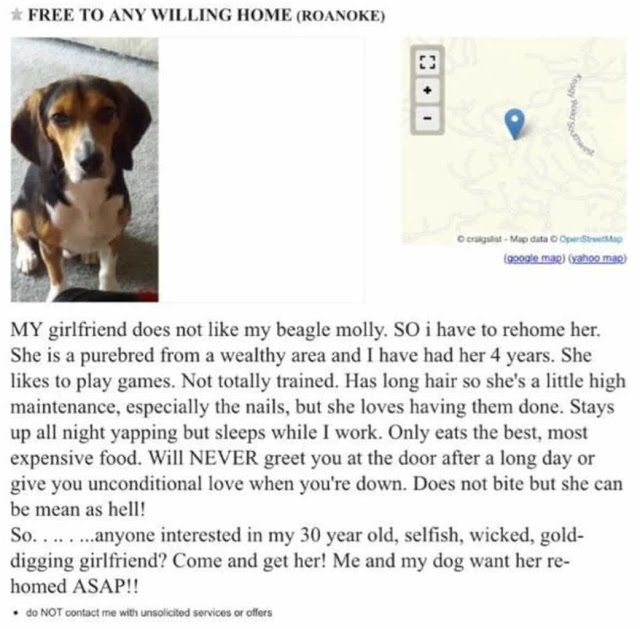 The owner of the Roanoke Virginia beagle owner decided to post a hilarious craigslist searching ‘any willing home’ for his ‘purebred’ and the best thing was that the advertisement was to rehome the girlfriend and not the pet! It seems as if Molly’s dad is speaking about Molly, but readers soon learn that this isn’t the case. It actually seems like a dog that would be a nightmare to adapt. Rehome… that’s a very nice way of saying dumped! We still are unable to understand how someone could even ask that of another person. So, what would you do if your lover asks you to select between the pet and them?